Man, I’ve been working 65-70 hour weeks again , and it’s hard to keep up with all of the new threads and posts on CHR. I’m taking a little break right now, and just wanted to tell you Al that I don’t think ole eddybo was trying to start up an “attitude” post... I think the fellow just transposed his “literate and illiterate”. BUT BOY does that put a different connotation on the meaning of the post! Eddybo, proof read this stuff or you’re going to get a “flaming” thread started! Al, I’d like to see ole blury lined up against streets too. But there’s going to have to be a mighty big spot by streets (let the cat ride in the T?) unless blurry can do something serious to that Rambler’s 6. I saw where streets made an 8 second 160 mph run in that T of his... talking about your white knuckled ride to the corner store to pick up a six pack – streets could give you one! OK, I’ve killed enough time and had better get back to making a living. P.S. Dave, since you’re getting rid of the tunes equipment, I’ll help you out of a bind and take the stuff off your hands Don’t worry, I’ll pay for the shipping. Whoops, damn thought I was just getting flamed for my spelling. I did not even realise that I transposed the literate and illiterate. Thanks for pointing that out to me, Dan. I was just trying to compliment all you guys on your well thought out responses and the starter of this thread for his post. Did not mean to offend anyone, but that is what happens when you are doing ten things at once. As far as the illiterate hotrodders that I am reffered to I am talking about some of my closest friends. They may not be able to read or write too well but they know more about cars than just about anyone. If you guys are going to make me spell check this I guess I will just read the post and keep my fingers away from the keyboard. Geeez, I feel stupid, thanks for pointing out my error Dan. Sorry Alshow. Okay guys, is it time for a group hug now?? Street, I don't know if that's you and your cat or not. but that picture has been on the net for about 2 years. My wife works at animal rescue group. and they have that picture on the wall. The only dumb question is the one you don't ask.. Car Year, Make, Model: . eddybo, Ya dont hafta spel gud ta bee a rodda. Unless you paint something on your car.Like "Born too loose" when you mean "Born to lose". I misspell things a lot and nobody says anything. I shouldn't type without my glasses on. Or after too many beers. It helps if you read it before you post it but I still miss my mistakes sometimes. Dave, don't clean out the trunk. When your favorite song comes on the radio you have to be able to crank it up loud enough to drown out the exhaust and wind noise. Streets, Is that a dog in a cat suit? Or did you paint a bobcat ? Do the neighbors cats keep disappearing? Have you sent a picture to the Guiness book of records? Two years ago to the day this was originally written. And guess what....................it still applies! Since then this "rat rod" thing has gotten a lot more attention......................now it seems the biggest snobs in the car world are the rat rod know-it-alls who think they're the only REAL hot rodders. Funny thing about "rat rods", a few years ago Street Rodder mag had on it's cover a '27 fenderless tub (I believe,could be wrong about the year) on their cover and they called it a "beater". What goes around comes around and I'm no fan of snobs no matter what shape they come in. They take life way tooooo serious. Yanno what this brings to mind for me is the eternal conflict between many of the Harley owners & "the other people". I'm a rider, period. I dont have a bike I ride on Sundays IF it's sunny. Thats just someone who rides. I ride everyday year round, rain, wind, sometimes snow if I have to. I'm a "rider". BUT, the pinhead yuppie who bought a HD coz he thought it was like getting coolness in a can looks down on me coz I elected to go with a cheaper (yet amazingly superior product to a comparible HD) bike. Yeah, whatever. I dont care what you ride, just ride it! Do it coz you love it, not coz it's "cool". That applies to pretty much everything in life when it comes down to it. As far as hotrodding snobs, I've been pretty lucky with my lil monstrosity, I believe because it's something different in a sea of similarity. Yet I have experienced the disdain expressed by so called purists that believe that if it aint old American iron, it aint $h!t. When some self proclaimed rodding expert tries tellin me my car isn't worth the rubber on the wheels coz it's "not a real hotrod" irritates me to no end & can kindly go hug a nut. I dig ALL cars, old & new, whether they were hammered out of american iron, German steel, or Japanese tin cans. Being unable to appreciate them all is missing out on a world of great things. "Was the first image of a hot rod snob that popped into your mind a gold chain wearin', store bought rod drivin', loud braggin', insufferably borin', power parkin', boor? " Thanks for bringing this post back to the top Bob. Though I wasn't around CHR when it was originally posted, I did stumble across it in the archives some time ago. Lots of people have come and gone since then, but it is as applicable today as the day you wrote it. It should indeed be required reading for all of us. 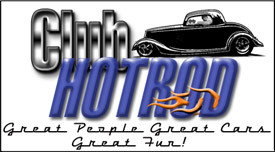 Great post Bob, I have wondered if anyone felt the same passion for all of hot rodding that I did. A while back when I first started enjoying this forum, I made the mistake of saying that these tuner guys are hotrodders. I was drug into the tuner scene by my young son who wanted to build one. I found that it was still a matter of expression and creativity. I look forward to the changes in automotives in the future. With soring gas prices, we should see a variety of non conforming creations. Thanks again for your insite.
" when you start paying the bills on it.............you can have an opinon "
Great post--I like all tyes of cars but usually drive ones older than 1957. I really don't know what the true meaning of a rodder is as there are so many different types of cars out there. The axiom I try to adhere to is "the only person you have to please is yourself". So enjoy what you drive and watch out for the old Porch Dog. Car Year, Make, Model: 53 Studebaker Pickup, 65 Corvair Convrt. It seems that you will always come across the occasional yutz that calls himself a hot-rodder...You all know the ones...The "My car is better than yours will ever think of being" kind of guy, who prides himself in stroking his own ego. Very few, of which I might add, ever get driven. He brags about maintaining these vehicles himself, yet, whenever there is a problem with one, the only thing he does is take it to the local mechanic to fix the problem. So...while he had the hood up, and was inside fiddle-fartin' around, I tinkered with the carbs a bit, and what do ya know...it runs fine now...go figure.